You have family coming into town, a birthday party with your closest friends, or are simply searching for “places to eat near me.” Where are you going to go? Twist on Thai café is your answer no matter the question. When it comes time for a nice, fun occasion, you’re on the hunt for good places to eat. Why not try something tasty, healthy, and a bit removed from your normal diet? That’s right — Thai food. We don’t cater, but you can always make reservations at our restaurant right next to Lake Hopatcong. We can’t wait to serve you and the rest of your party! What better way to celebrate your birthday or your friend’s birthday than with a night out on the town while gorging yourself on Thai food? There’s something for everyone’s taste buds at Thai restaurants, but you can try new Thai food at ours! Twist on Thai café is just that — a twist on Thai! We have your classic Thai dishes, but we also incorporate other unique, modern ingredients and dishes to change it up a bit. Get ready to Thai the knot at your nearest Thai restaurant. One of the best parts of weddings is all the family who visits from out of town. Instead of slaving away in the kitchen to feed everyone, visit Twist on Thai café and actually enjoy time with your visiting friends and family. There are the gluten-free, meat-lover, vegetarian, and picky coworkers — and all you want is some tasty food and team bonding. Choose a vegetarian-friendly restaurant like Twist on Thai café to satisfy everyone’s tastes. 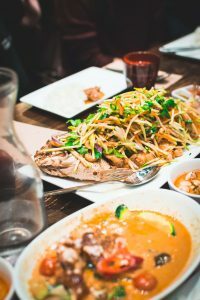 Thai cuisine has something for everyone, and our waiters are more than willing to accommodate everyone’s varying needs. Show your interest in your date while basking in the beautiful setting of Lake Hopatcong, eating exquisite Thai dishes, and supporting local businesses — it’s a win-win all around. When you bring your own beer to our Thai food restaurant, you’ll almost feel like you’re on a tasty, romantic picnic (without any of the headache of actually preparing the food). You’ll love sharing one of our desserts, or even getting two and trying each! Do you really need an excuse to eat delicious Thai cuisine? Though we certainly don’t mind you sharing your special nights with us, we’re happy to see you other times as well. 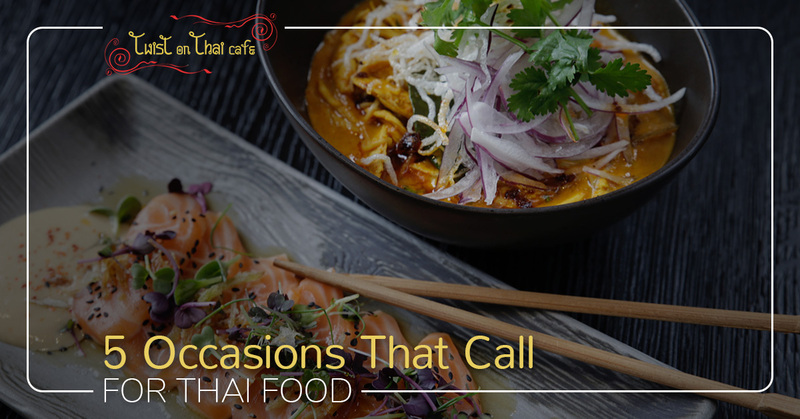 Whether it’s that you need a night out of the house, feel like eating out, ruined your meal while cooking Thai food at home, or simply don’t want to cook, visit our Asian restaurant. At Twist on Thai café, we’re always introducing new menu items; even if you’ve been here before, there may be a new Thai dish that’s calling to you. Whether you’re visiting us for one of these special events or just because, we can’t wait to have you and your friends or family in our Thai restaurant. Check out our menu and make a reservation today.